The obverse features clouds, with the facsimile signature of Eduards Veidenbaums semi-circled at the top left of them. The cloud in the central part of the coin bears the inscription of the year 2017 on the right side. 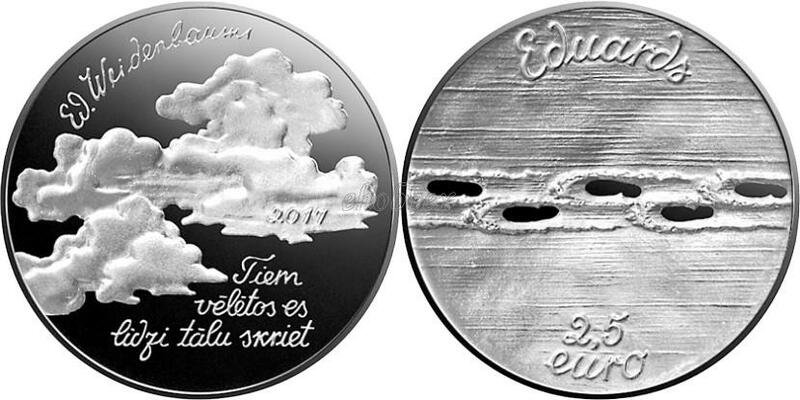 A line of Eduards Veidenbaums' verse "Tiem vēlētos es līdzi tālu skriet…" (I'd love to follow them far away...) is placed at the bottom of the coin. An inscription "Eduards" is semi-circled at the top; an inscription "2,5 euro" is placed at the bottom. A horizontal trail of footprints in the snow crosses the reverse in the middle.